How to build a travel website that doesn’t get swept under all the noise of Expedia, lastminute.com and all the industry big players, as well as the thousands of other competing small business owners. Don't worry, It is possible! www.anguilla-beaches.com was built by a 14-year old girl called Nori Evoy. Her website is at the top of Google for hundreds of different search terms to do with Anguilla. Cool huh? Travel is big business; but it is very fragmented. 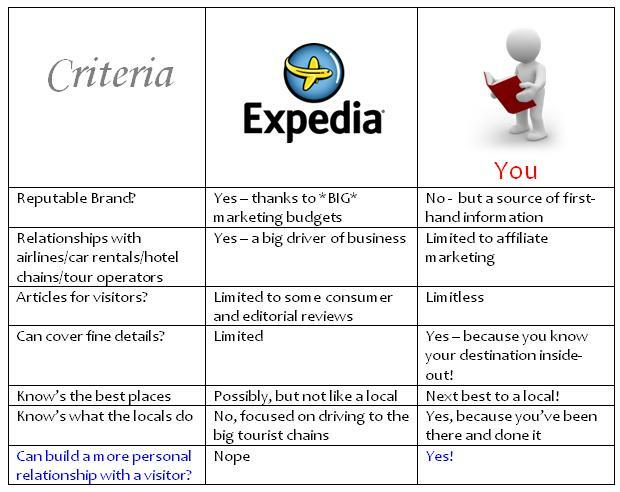 The shear expanse of the travel industry means that even the biggest and the best companies such as Expedia cannot cover it all – the entire ’travel industry’. Sure, they can take a lion’s share of it, but they can’t zoom in and focus in on every minute detail. This lends itself well to smaller niche players who can ‘own’ their particular niche area – people like YOU!. I want to become a home travel agent where do I start? Let me turn that question around; where in the world do you know and love the most? Where could you see yourself getting to know more and writing about everyday? Where do aspire to travel to? Your dream destination? Now how would you build a travel website around that your dream destination? Not sure? I've prepared a little brainstormer to get the best out of your destination and produce some ideas for building a website. … go to your destination and do your brainstorming whilst you are there - whilst you are walking the streets, breathing the air, meeting the people, eating the food. Take your photos and feel the atmosphere..
Now armed with your destination ideas, let's get some thoughts written down. Download this little text file template for stimulating some ideas for your chosen destination and fill it out. Why? Because in part two I'll show you how you can make money out of your ideas and your passion – and you won’t want to forget those great ideas! >>> View and Download our little text file Brainstorming Template now and get those ideas down! You could write it down on a piece of paper, but there’s a chance you might lose it. Finding a file on a computer is (usually) easier than digging under intolerably big mountains of paper … I find anyway! Perhaps use a little sticky notepad? Help! I can’t write and build a travel website about my destination! Oh yes you can! You talk to people all the time, simply because you have a keyboard in front of you doesn’t shut you off from sharing your experiences and pearls of wisdom. If you think you’ll have a problem ‘talking’ online, download this free e-Book ‘Make Your Content PREsell!’. It’ll knock any doubt out of you! Here is an unedited picture I took en route for a pre-Christmas break in Vienna. 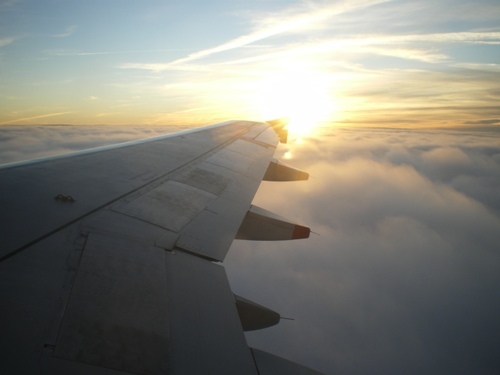 Having barely broken the clouds above Heathrow, we were treated throughout the flight to the most spectacular sunsets from the comfort of a leather chair (our flight back was at a similar time – double the pleasure!). The gentle hum of the engines and the occasional chink of coffee cups from the galley as flight attendants prepare your afternoon tea. Moments later, a selection of sandwiches appear before you as the sky turns a shade darker. You feel the soft leather brush your body from the backs of your legs right up to your neck and cheeks. The warmth of the dying sun illuminates your face as you drift off in a state of relaxation, four miles in the sky. That flight was one of the most memorable I’ve ever had the privilege to fly on. I’ve tried to share that with you through the power of words, just a few minutes. Your job is the make your reader feel like they’re at your destination whilst sitting in front of a computer. Tricky isn’t it? What I tried to do was stimulate the senses – say your destination is on the coast? Integrate the rhythm of waves on a beach, the smell of seafood, images of boats. That kind of idea. You're not just going to build a travel website - you're going to build credibility and trust. A relationship with your visitor. Bring your destination to your visitor to bring your visitor to the destination. Move Forward > Part 2: Make Your Internet Travel Business Thrive!